Good Morning. Well we are on the last day of the alphabet. I present to you the letter Z. 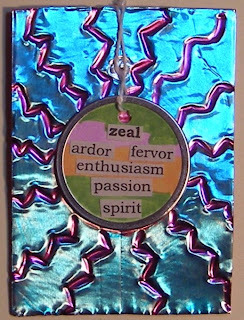 And I think that zeal is a good word. I was talking with a social worker yesterday about her work and the topic of getting out of family situations that are not helpful to young students came up. We acknowledged that getting out of violence, poor health, poverty, chemical use/abuse, and other chronic stresses takes an enormous amount of energy. Especially if these have been a part of a family system for generations. I was thinking this morning that zeal would be a good quality to have if one were trying such a move. And again, I have this thought: Is it a passion or enthusiasm to get out of a situation? Or does ardor and spirit work best if we want to move in to a new place?